Hockey Night in Canada podcast: Where have all the rivalries gone? On this week's episode, Kris Draper and Chris Nilan share war stories from the old Wings-Avs and Habs-Nordiques battles and some active NHLers stick up for today's rivalries. It's one of the nastiest grudges in the history of the NHL. 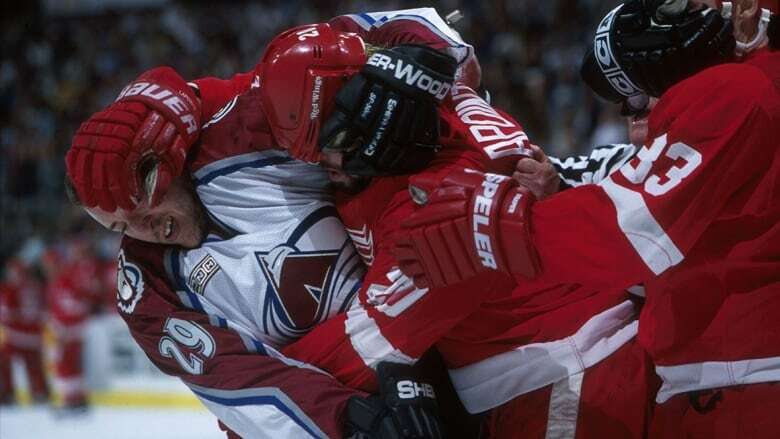 And if we want to understand what's become of rivalries today, what better place to start than the loathing between the Red Wings and Avalanche of the late '90s and early 2000s. Rob Pizzo kicks off this week's episode of the Hockey Night In Canada podcast by talking to former Detroit forward Kris Draper, who was famously clobbered from behind by Colorado's Claude Lemieux in the 1996 playoffs. The hit left Draper with a broken orbital bone, cheekbone, nose and jaw, along with a concussion. It also ignited the Detroit-Colorado war, and Kris talks about his current relationship with Lemieux and the bad blood that is still simmering more than two decades later. Former NHL pugilist Chris Nilan also joins the show and pulls no punches in telling Rob about one of the most infamous brawls on ice — the Good Friday Massacre in 1984. The Quebec Nordiques and Montreal Canadiens may have thrown all the punches, but Nilan still lays the blame squarely on former NHL official Bruce Hood. To close the show, features producer Sophia Jurksztowicz brings the rivalry discussion up to the minute with current NHLers James van Riemsdyk of the Philadelphia Flyers and Marc Staal of the New York Rangers. Hockey's retirees may claim that all the most heated rivalries are in the past, but these two active players make a good case for today's rivalries having all the same passion and intensity they did in previous decades — event if there's a lot less blood spilled nowadays. Click here to listen to this week's full episode and be sure to subscribe to get a new one every week. The show is available on iTunes, Google Podcasts, Stitcher, Tune In or wherever you get your podcasts.